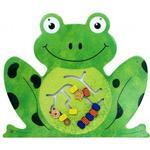 The Frog Wall Panel is a wonderful addition to liven up the walls of any play area, classroom, waiting room, or home and provide hours of educational fun! The Frog Wall Panel is a wonderful addition to liven up the walls of any play area, classroom, waiting room, or home and provide hours of educational fun! It boasts adorable artwork of a very content frog which has a full stomach made up of our Caterpillar Pathfinder game! Watch as kids move the beads along the tracks and match up the colors of the caterpillars head with its legs! Keeps kids busy while challenging logical thinking and helping develop eye-hand coordination and color recognition. This panel is part of a series of smaller wall panels intended for individual play. Make sure to check out the other cute Bear, Cow and Parrot Wall Panels to complete your set! 15" x 19.5" x 2"